After eating or drinking something, you may feel a slimy, thick film over your teeth. That usually prompts some of us to brush our teeth right away or even take a napkin and rub the film off our teeth. That sticky substance is called plaque. This is the stuff you’re trying to remove every time you brush and floss — sometimes you can’t see it, but it’s still important to remove it. Although plaque is natural, it’s one of your smile’s worst enemies. But why? Your dentist in Toledo explains how plaque can harm your teeth and gums and what Dental Group West can do to help you. Plaque is a sticky film that is constantly forming on your teeth. It’s made of dental bacteria, leftover food, and other harmful debris. Although this is a natural process for your body, you shouldn’t neglect plaque buildup! These bacteria are damaging and you don’t want to give them the chance to move in and take over. How does plaque harm the body? Removing plaque is the whole point of your dental routine at home. If you neglect your dental routine or regular professional cleaning, you will activate the immune system unnecessarily, which leads to inflammation in the body. Long term inflammation in the body can develop deadly systematic diseases that affect your overall health. 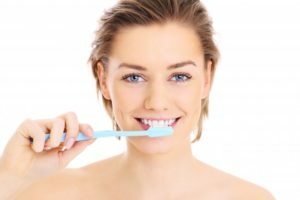 How does plaque form in the mouth? The bacteria in your mouth have a heyday when you eat — the food you eat gets broken down and the bacteria feast on simple sugars. The acid excreted by bacteria after they consume sugars is their waste product and the stuff that leads to bad breath, tooth decay, destruction of enamel, and cavities. Dun, dun, dun! It gets worse…if you don’t remove plaque promptly, it starts to harden. Then it becomes literally impossible to remove with just a toothbrush and floss. This hardened plaque is called tartar. What’s the best way to effectively remove plaque? You want to catch plaque in its earliest stages — before it turns to tartar. Brushing and flossing scrub away plaque before it can cause much damage. But what if you don’t floss? You should start! If you’re not flossing, you’re leaving behind most of this plaque. In fact, if you skip flossing, you’re not cleaning 35% of your smile’s surfaces. Brush at least two times a day. Floss daily. As with brushing, frequency and quality are important. Get regular professional cleanings and dental exams from your Toledo dentist. Eat a diet high in vegetables and limit starchy carbs. Ask your dentist about sealants. Dental sealants can be a great option for kids to prevent plaque buildup. How can I remove tartar at home? You can’t. Why not? Imagine the bottom of a boat whose scum has hardened over the years. Trying to remove the debris with a simple brush is going to be very difficult. The same goes for your teeth! We recommend that you visit a dental professional at least every six months so that we can remove tartar from those hard to reach areas, keeping your mouth squeaky clean and healthy. Contact us today to schedule your next appointment!